The mypillowprinter.com design template allows users to select colors using the eyedropper tool. In addition users can specify colors using RGB values. When a color is selected with the eyedropper tool the RGB values for the selected color are displayed. If a user wants to match cording or pillow back colors you can simply enter the RGB values from the pillow design you are trying to match. In addition pillows that you have purchased list the RGB values for cording and the back side of the pillow on the invoice and packing slips. There can be some variation between the same RGB value based colors, especially those ordered months or years apart due to variations in the base fabric and manufacturing tolerances. If there are variations most customers consider them acceptable. RGB values can also be used to specify colors for the back and cording that are not present in the uploaded image. For example, this allows a user to place red cording on a pillow with a black and white image. 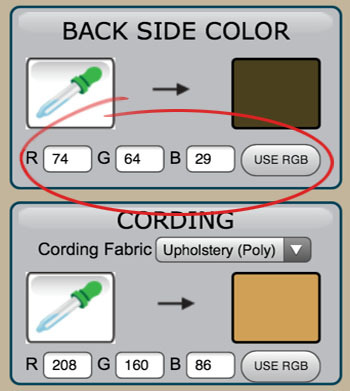 The colors numbers on the fabric swatch "RGB Colors Values Map" refer to the RGB color table on the right. 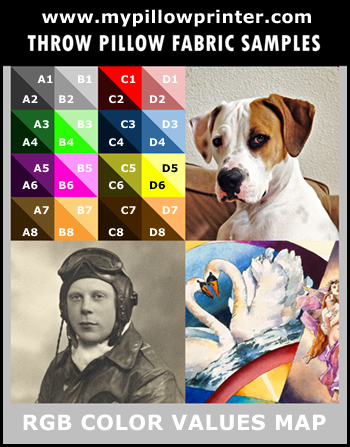 These are the color values used to print your actual Fabric Sample (fabric samples are available for $5). You can also see the variation in the same color RGB values printed on each of our fabric types. More Tips & Tricks For Your Pillow Designs Coming Soon!